Pearly tree frog (Nyctixalus margaritifer) is a Javanese endemic that is listed as Vulnerable by the IUCN because of a continuing decline in areas of suitable habitat. We will work at Mount Ungaran - one of the last pristine areas of habitat, an Alliance for Zero Extinction area and Important Bird Area in central Java - which is not currently protected. 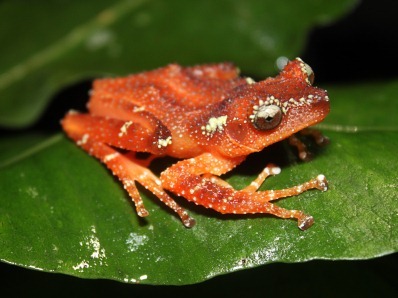 We aim to assess the conservation status and ecological requirements of the pearly tree frog and use the data to initiate a long-term conservation programme. We will work with local government and local communities to provide suitable conservation strategies to ensure the survival of the population at Mount Ungaran, we will also conduct an awareness-raising and education campaign. Mark-recapture and acoustic encounter survey techniques will be used to estimate their population and GIS will be used to determine their distribution. We will collect data on temperature, rainfall, humidity and other components of microhabitat, and we will also provide habitat profile to determine their habitat characteristic. The results will influence decision-makers to develop a protected area at Mount Ungaran and will also contribute to the development of an amphibian conservation action plan for Indonesia.